Whale watching in Washington State is most popular April through September and usually focuses on the area around the San Juan Islands. With a huge variety of marine life, orca whales are just a portion of the wildlife you will see while in the San Juans. Though whales often are seen from shore, most enthusiasts choose to view whales from the water aboard kayaks, charter boats or private watercraft. You will find a number of local charter boat companies and kayaking outfitters departing from various ports within the islands. Additionally, many outfitters also depart from various other ports around Puget Sound and the mainland including Seattle, Anacortes, Bellingham, Everett and Port Townsend. Many of the local charter boats will have naturalists aboard that can tell you more about the Orca and even identify individual whales. These naturalists will also be able to point out other marine life you might see during your whale watching adventure. The majestic Orca Whales, also known as "Killer Whales," travel through and live within the waters surrounding the San Juan Islands. While whale watching, there are two different major groups of whales you might encounter. Orcas will fall into one of two different groups, either Transient or Resident. Transient Orcas only eat mammals, while Resident Orcas only eat fish. The Resident Orcas that live throughout the San Juan Islands are comprised of three different pods, "J," "K," and "L."
If you are staying overnight on the Islands you may want to use the services of one of the local outfitters or charter companies. 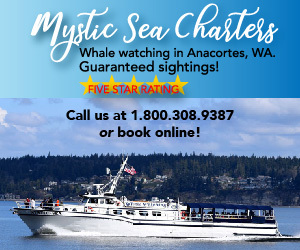 You will find many listed on our local whale watching charters and tours page. On the other hand, if you want to go whale watching as a day trip from elsewhere in the region, look for an operator departing from a port in the city or town you will be visiting. You will find them listed on our Mainland Whale Watching Charters and Tours page. For more on whales and whale watching, see our related links page.